Theodor Herzl envisioned a Jewish homeland in Palestine when it became apparent that Europe still clung to Antisemitism in the modern world. Israel became a sovereign nation May 14, 1948. Persecuted and treated as strangers for centuries, Jews returned to the Promised Land to turn barren deserts into fertile, agricultural fields. Theodor Herzl’s solution to the “Jewish question” was fulfilled. According to Herzl’s treatise The Jewish State, the return to an historical homeland was not a Utopian vision, but the obvious solution to “the misery of Jews.” Herzl, writing in the late 19th Century, was not convinced that a modern, industrialized Europe would accept Jews as equals. His 1896 “political solution,” published in Vienna, was a logical and reasoned answer to on-going Jewish persecution. Herzl wrote at a time of renewed persecution and anti-Semitism. Under Tsar Alexander III of Russia, pogroms targeted Jewish communities. In 1894, the trial of Alfred Dreyfus took place in France, focusing on Dreyfus’ Jewish roots. The “Dreyfus Affair” brought to the surface intense French anti-Semitism. In The Jewish State, Herzl reminded his readers that Jews have always been ostracized as people of the ghetto, and treated as strangers in communities they had lived in for many generations. Herzl may have recalled the expulsion of Jews from Spain in 1492. Jewish communities in Spain had existed for centuries, as had the Muslims. But in 1492 King Ferdinand endeavored to turn Spain into a solidly Catholic nation. This was the same king who gave life to the infamous “Spanish Inquisition.” Spanish Jews left Spain aboard ships at the same time Christopher Columbus was leaving Europe to cross the Atlantic. Herzl attempted to negotiate with the Ottoman sultan in Turkey as well as Germany’s Kaiser Wilhelm II to secure a Jewish homeland in Palestine. Unsuccessful, he turned to England. 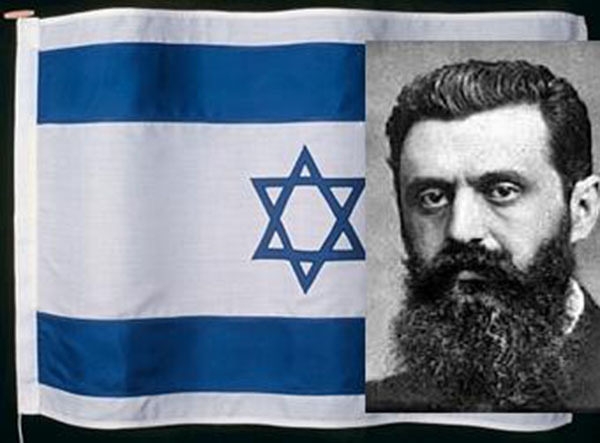 Although Herzl died in 1904, the Zionist cause found its greatest support in England. The defeat of the Ottomans in World War One opened the door to Zionist hopes. Herzl’s dream became reality. On November 2, 1917, Arthur James Lord Balfour wrote Lord Rothschild, stating that, “His Majesty’s Government view with favour the establishment in Palestine of a national home for the Jewish people, and will use their best endeavours to facilitate the achievement of this object…” The Versailles peace deliberations placed Palestine under the British as a “mandate” or sphere of influence. The Balfour Declaration, however, was an important step toward the eventual establishment of an independent Jewish state in the Middle East. Louis Lipsky, a leader in the early 20th Century Zionist movement in America, writes that, “Through Herzl, Jews were taught not to fear the consequences of an international movement to demand their national freedom.” Jewish migrations to Palestine increased after World War II and the horrific realities of the Holocaust. As Herzl noted in his treatise, anti-Semitism was even evident in the United States, a place Jews fled to in the late 19th Century and during the 1930s. Even American religious leaders, like Father Charles Coughlin, reiterated centuries’ old prejudices and stereotypes against Jews. After World War II, American Jews supported the state of Israel and many migrated to the Middle East. Israel’s fourth Prime Minister, Gold Meir, was elected in 1969. Although born in Kiev, Mrs. Meir migrated to the United States, eventually teaching in the Milwaukee, Wisconsin school district. Like many American Jews, she was a committed Zionist. By 1948, however, the Jews in Palestine were fighting a battle for independence. The British government had made the homeland possible, but events in the Middle East had changed. Britain opposed an independent Jewish state. Additionally, Arab neighbors rejected an independent Israel. This conflict led to the still on-going battles between Israel and her Arab neighbors. Theodor Herzl was correct in identifying the causes and effects of anti-Semitism. Many of his examples could be applied to Germany at the time Nazis were consolidating power and defining new “race laws.” Herzl refers to the phrase “Juden Raus,” (Out with the Jews) and the boycotts of Jewish businesses. Beyond these daily realities, however, Herzl focused on an attitude, formed by centuries of prejudice and intolerance. There was no country so hospitable as to assimilate Jews as equals. The only logical solution was an independent Jewish state. Jews returning to Palestine to build this new state were not only a fulfillment of Old Testament prophecies, but a modern resolution legitimized by historical realities.